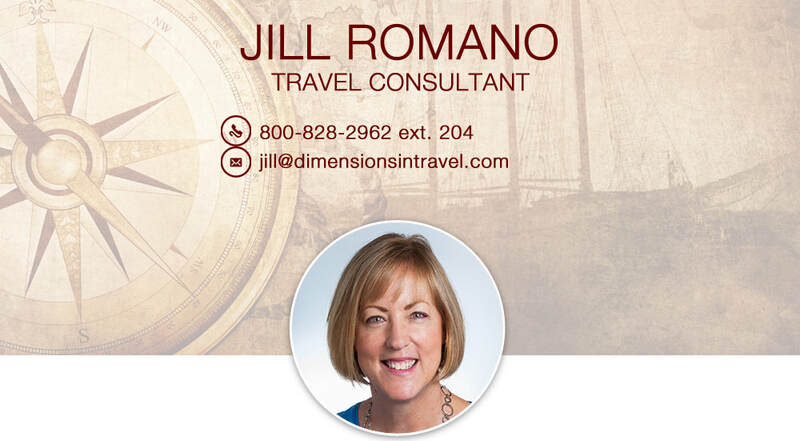 Jill Romano has worked for Dimensions in Travel since 1987, both as a senior travel consultant and office manager. She purchased the agency, along with Diana Saint James, in 2007. I am a South Pacific Specialist (Australia, Tahiti, and Fiji) and I just returned from Fiji. The warmth of the Fijians is apparent from the moment you arrive and there is NO tipping - really. My favorite Fiji experiences were the quiet, remote Likuliku Resort (in the Mamanuca Islands) with lovely over-the-water bures (bungalows); Taveuni Palms (perfect for weddings) and Taveuni's the Pearl Farm Tour or Waitabu Marine Park offering a rafting trip, snorkeling and cava drinking ceremony; and the treehouse accommodations, kayaking and diving on Matagni Island. ​I'll be escorting a Scenic Rhone river cruise in September 2018. Join me! Sipping hot chocolate in the mid-morning sunshine at small café on the Left Bank in Paris; a girls weekend in London eating great food, shopping and going to the theatre each night; sailing out of Venice on a tall ship past St. Marks Square; and family vacations in Hawaii where we enjoy the inviting Ohana spirit and that special time that exists only when your loved ones are near. Creating beautiful travel memories for my clients! My areas of expertise include custom tailored itineraries to Italy, France and the UK as well as many other European countries. I love to cruise and some of my favorites are Regent Seven Seas, Crystal and Sea Dream. I believe the best way to see Old World Europe is through river cruising. After living in England for three years while earning a degree in Art History at the University of East Anglia, my travels have taken me to France, Ireland, England, Scotland, Switzerland, the Czech Republic, Hungary, Turkey, Greece, the Dalmatian Coast, China, Thailand, Malaysia, Singapore, Myanmar, the Canadian Rockies, Hawaii, Alaska, Yellowstone and Yosemite National Parks, Africa and Egypt. Egypt was fascinating. The wonders of the ancient world and the chaos of the modern all seems to work in a unique harmony. Cairo was a busy as ever, however the renovations of monuments and neighborhoods were a delightful surprise. I especially enjoyed our cruise on the Sunboat IV visiting Abu Simbel, the Valley of the Kings and Queens combined with the slow, leisurely cruise along the Nile. We had a private tour of the Cairo Museum after hours as well as visits to the generally closed to the public, tombs of Seti the 1st and Nefertari.